When you are remodeling a bathroom with a shower, we offer a highest quality of shower floor tile materials with beautiful patterns, colors and textures that will give you a luxurious and relaxing shower environment. 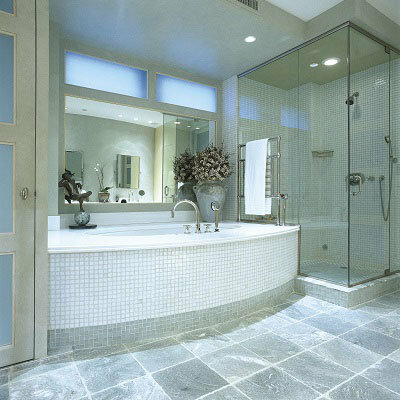 While choosing bathroom shower floor, special factors to be taken care of. It requires withstanding the constant moisture in the area, with surfaces easy to clean and also easy to walk through. To help you decide the best tile ideas for your shower flooring, our design experts are here to choose the one that matches with your decor and that express your personality and style. Explore our endless selection of shower floor tiles to make your bathroom shower incredibly stylish. Overview: Concrete tiles are unique and one of the best materials when it comes to shower floors because it gives a look of very old encaustic style to floors. These tiles are trendy from last few decades. 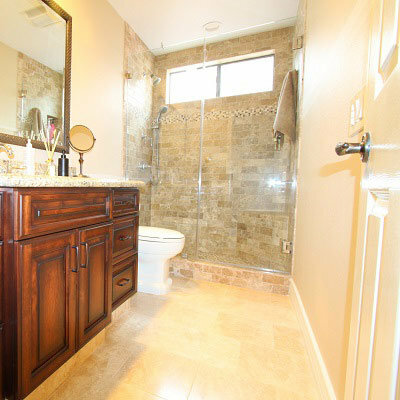 Our Bathroom Tile store provides a variety of styles and patterns in Concrete Tiles. Advantages: These tiles look beautiful and give a natural look. It’s simple, easy to clean, easy to maintain and very versatile. It provides a beautiful texture and any color theme to the decor. Concrete Tiles provide a non-slippery and cost-effective surface ideal for the shower floor. It doesn’t get outdated because it’s an evergreen choice for people. Downsides: Concrete tiles can absorb water very easily and get the stains and moss. Overview: One of the most popular tiles is porcelain tile nowadays for Shower Flooring. Its simplicity can drag the attraction of anyone so easily. Advantages: porcelain tiles are very less prone to moisture absorbing. It comes in so many styles and textures when using for floor purpose. It is hard wearing material so there can be very fewer stains and scratches. 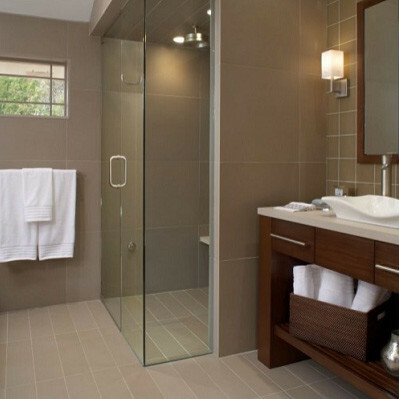 Porcelain is very durable and water-resistant, so it can hold up to shower floor purpose. Downsides: The main disadvantage of this tile is its density. It is very hard so it is very tough to cut the tiles and is heavy in weight. Overview: Travertine, a perfect natural stone that has the best of earth’s composed materials comes into designer tiles that beutifies your home. Downsides: Travertine is porous in nature, so recommended to seal the flooring while installing. Be careful to use chemical inherited cleaners to avoid from any damage on surface, even a mild detergent can affect the stone’s surface. 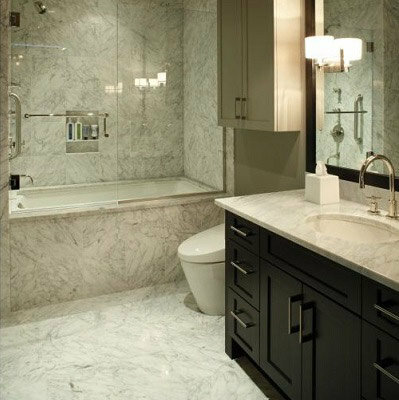 Overview: Marble is a metamorphic rock composed of calcite or dolomite. It gives a luxurious look to the home where it is used. Advantages: Marble tile are much tolerant to the polishing. With the help of polishing, you can keep your walls always smooth and shiny. Though it is natural, it is bio-degradable and makes it eco-friendly. Downsides: Marble stone comes at a high price than other materials. It can get scratches easily so need to be careful while choosing toiletries and other products. Overview: Pebble tile is one of the most stylish and ideal materials you can use in the bathroom shower floor. Soothing and warm textured surface underfoot and very durable. 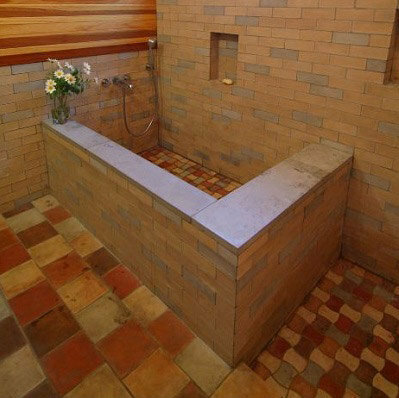 Advantages: Pebble stone Tile does make feel with a soothing touch and organic look. It is available in different colors and patterns and very strong. Though it is an eco-friendly material it doesn’t cause any harm to the environment. Pebbles are naturally water resistant and provide very comfortable surface underfoot. These tiles are versatile in nature that can fit all styles and themes. Downsides: pebble tiles is a part of natural stone tiles so these tiles are highly porous in nature and it can soak up the stain mark very easily. Overview: Penny round tiles look beautiful while appearing on walls and floors and also it gives the look of twentieth-century look. Its size is comparatively very small as compared to other tiles. Advantages: As these tiles are very small in size so it is very easy to install in the shower floor. These tiles provide a great slip-resistant surface. Penny tile offers a lovely visual texture that is refined and available at a very cheap rate. Downsides: Tile can be slippery. But texturing solves that problem. Smaller tiles are less slippery because more grout is used and the grout acts as a non-skid surface. Overview: Mosaic tiles are known for its elegant look. In the recent years, these tiles have become more popular for both field and accent tiles. 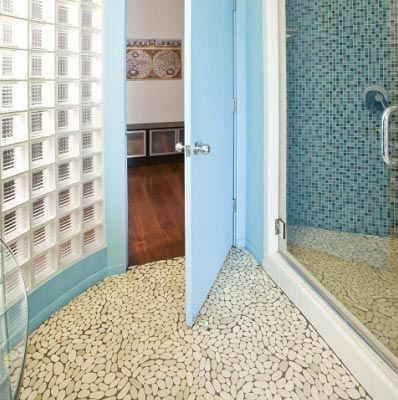 These luminous tiles can increase the look of the Shower floor. Advantages: If you like creativity then you should choose the mosaic tiles. You can get the customized designs in these tiles. It is high-density material. Downsides: In mosaic tiles, it is very difficult to remove the scratches and its attractiveness can be reduced drastically. Overview: This geometric shape tile is very much popular these days when using in bathroom shower floor. People, who like to create something new, can go with this shape tiles. Advantages: The whole floor covered with hexagon tile looks very appealing. This tile has the quality to hold the three tiled design together which looks good. Downsides: As these tiles have been given a particular shape so these tiles are made heavier and if any of the tiles get damaged then it is tough to get the same size with the same pattern back again. Overview: The limestone was first used for decorative purpose thousands of years ago by ancient Egyptians. Famous Egyptians pyramids are the examples of this stone. Nowadays, limestone tile is considered one of the most attractive stone tiles. Available at affordable prices. 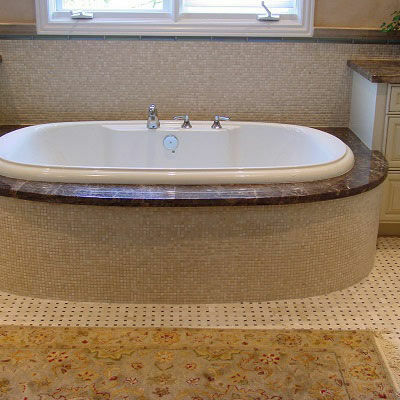 Advantages: Limestone is one of the most beautiful natural stone flooring options. It settles down so easily and is softer and lighter than other tile materials. If you have the time or any housekeeping help to maintain it then just go for it and make your bathroom more beautiful and appealing. 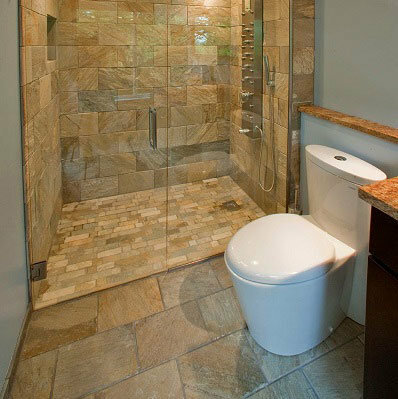 Limestone offers strong durability which is ideal for shower floor use. Downsides: It requires high maintenance. It is a soft stone material hence, can be lead to damage easily. Even after using a good quality sealant, it needs to be resealed after few years. Chemical inherited cleaners should not be used to clean which can damage the natural look of stone. Overview: Glass tile is basically a combination of technology and handmade art. It is so sophisticated material that from manufacturing to the installation of the tile, one should handle with care. Advantages: Its biggest advantage is the beauty of the tile. glass tile are dead set against stains and chemical damage. Waterproof in nature will bound you to purchase this tile for your shower floor. Downsides: Few people give a second thought to purchase the glass tile after knowing the rate. These tiles are tough to install and need a high maintenance. When you want to have an inspiring shower tile design, you should be accurate which type of design you want. A curved edge will give a lovely look on the back of the legs of the bench. Just try to keep it more attractive by using small patterns. You are advised to select the design first and then choose the tiles. But keep in mind not to use more than 3 different tiles. It may make the pattern of the design messed up and also do not choose more than 2 or 3 color options. If you choose one plain tile for the first preference then you can choose a colorful accent tile as a second option. If you are a working a person and don’t have proper time to take care of the tiles such as cleaning and mopping so we advise you to choose the tiles which are easy to clean and need very less maintenance. 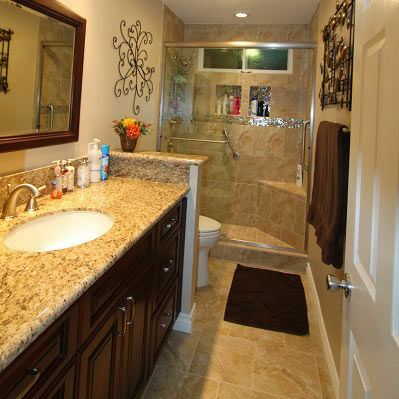 Glass tile and granite tile is tile which needs very less maintenance. While choosing the tiles for the bathroom, you should keep in mind that you shouldn’t use big designs or patterns in the bathroom. Especially when there are any curved designs in the area, try to use smaller tiles in the curvy area because small tiles would be very easy to cut down. You can use small tiles in sloped ceiling also. You should select a large-format tile for easy admittance to the shower and you can also use one tile throughout the installation because, with the help of this, you can make the room look much bigger. Small glass tiles are easy to install and easy for the maintenance purpose. Few big glass tiles can show moisture trapped behind it and that makes it look terrible so use small tiles which are easy to clean as well. Before starting up, just make sure that all preparation has been done properly. Ensure that cement backer board is not damaged by removing the old tile. If it is damaged you’ll have to remove the old backer board. Apply a waterproof covering to ensure that water is not going through. After all the preparation is done, just make sure it is measured properly and have enough time to complete the work. We advise you to keep a little extra material in case of any damage. You can start your work the second row up from the bottom. Because it is not sure the bathtub shape is square. Before you place the tile on the location, Measure a flat board match up with the same size of the project. Once you get the vertical starting point, mark it properly by installing a level board on the cement backer. It will provide a level base for your first row of tile and hold it in a place. You are advised to choose a mortar which properly suits your tile and use your tool and a mixing racket to prepare it and follow the guidance to use it. Adjust the mix properly and only mix it minimum 30 minutes of work. Use the flat side of the trowel and spread the adhesive everywhere with proper care. Use a combing motion to work the thin-set. Take precaution while using adhesive that it is not excessive. When you have laid out the tile then you have an idea where the cuts will be needed. You can use the grease pencil and mark the cut lines on the tiles that need trimming. Make it done using the tile cutter. Setting a tile is a process which needs care that design can be spoilt even with one wrong tile. Start applying the tile from the initial point you mark. Remember to begin on the board you installed. It is the best method to ensure that each row is going in a straight line. Always use proper sizes spacers as you install each one tile. When this step is done, let this project set for a while. When the tile setting is done the Next step is grouting the joints. Follow the mixing instructions carefully written on the packet. Once you have mixed the grout you are ready for this step. Make sure that all spacers are removed before applying grout. Use a float to remove the excess grout. When the grout gets hard it takes few minutes to get settle down. After that, use a sponge to wipe down the tiles. After 3-4 days of applying grout on tiles, finish it up with a grout sealer. Adding grout sealer to the grout, you can protect it from water stains and moisture retention.